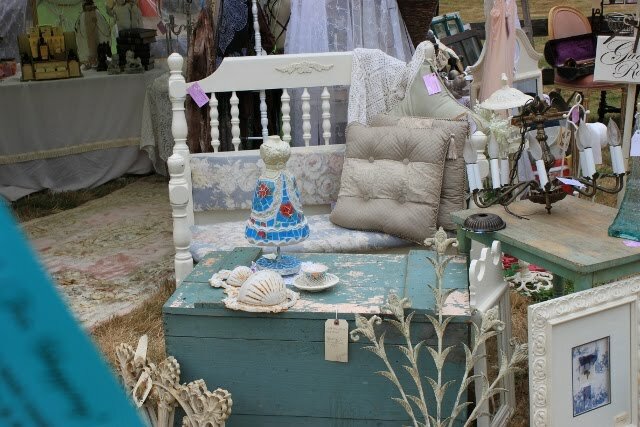 I’m so excited to tell you about the first French Flea Market I’ve ever attended. In fact, I believe it to be the first ever held in our neck of the woods. 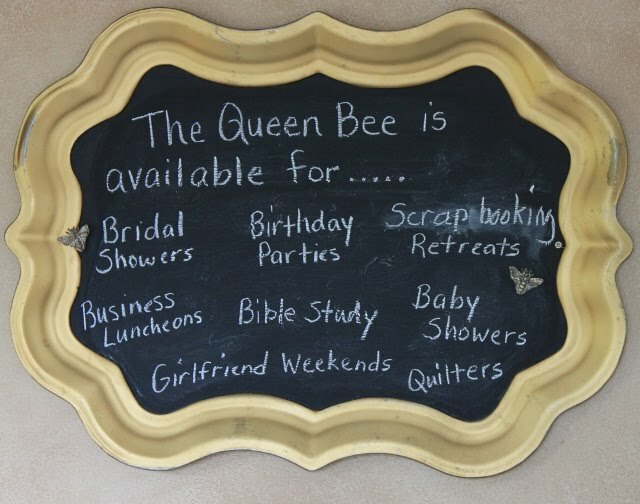 It was called A French Flea at The Queen Bee (I’ll tell you more about The Queen Bee later). 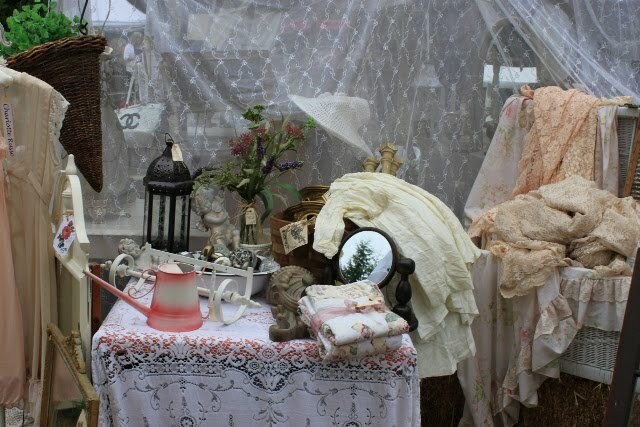 When I think of flea markets, something very different comes to mind than what I found at this lovely outdoor market. Not much description is really needed here, as the pictures tell the story. 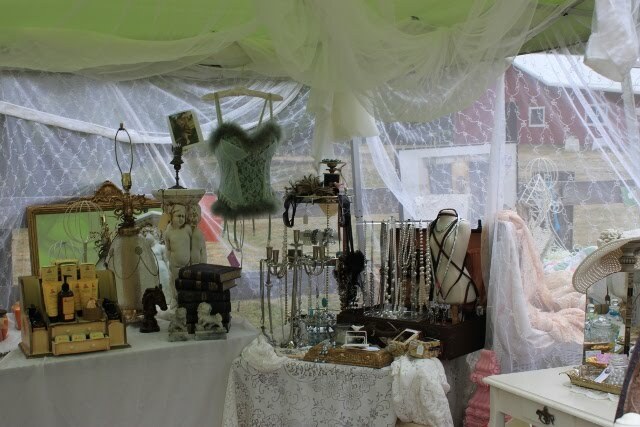 Not your typical Flea Market, right? 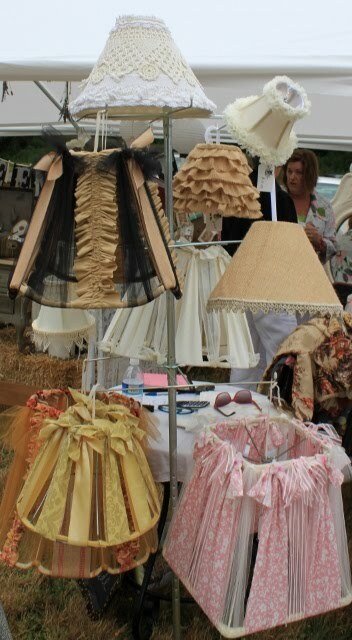 Look at these wonderful lamp shades! I’m so inspired. 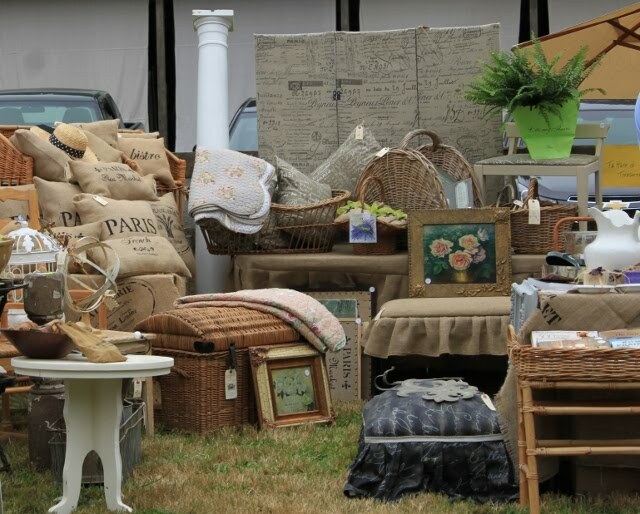 So many uses for burlap! 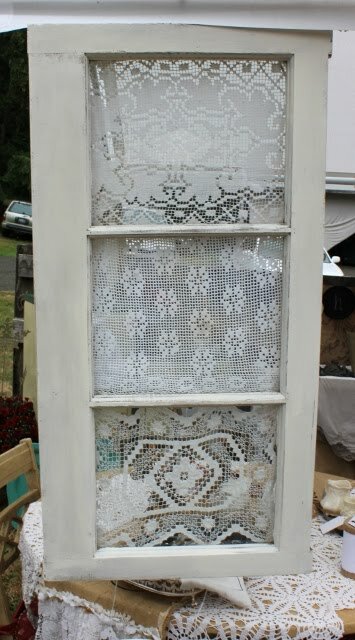 What a great idea for an old paned window. 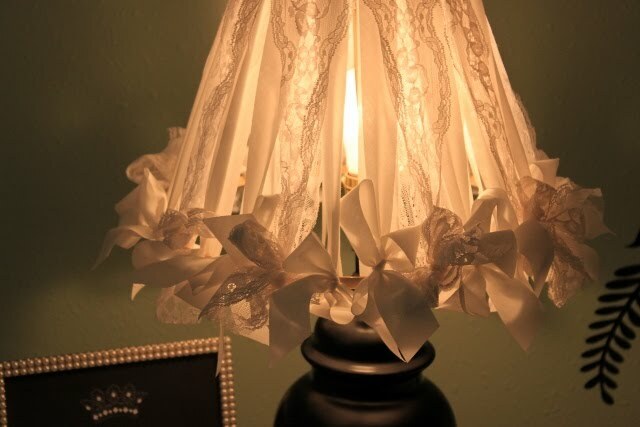 I think I need to do this in my bedroom. 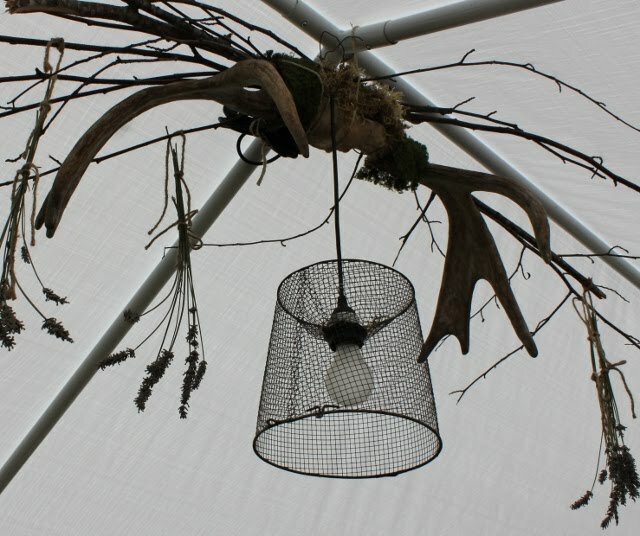 What do you think of this fun wire basket light fixture? 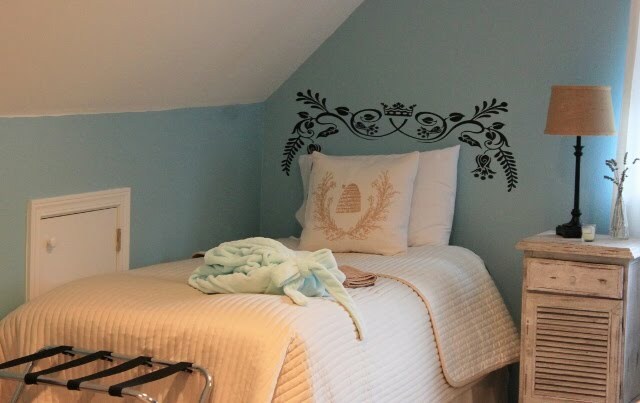 I think I’d like this for my future laundry room re-do (minus the antlers of course). 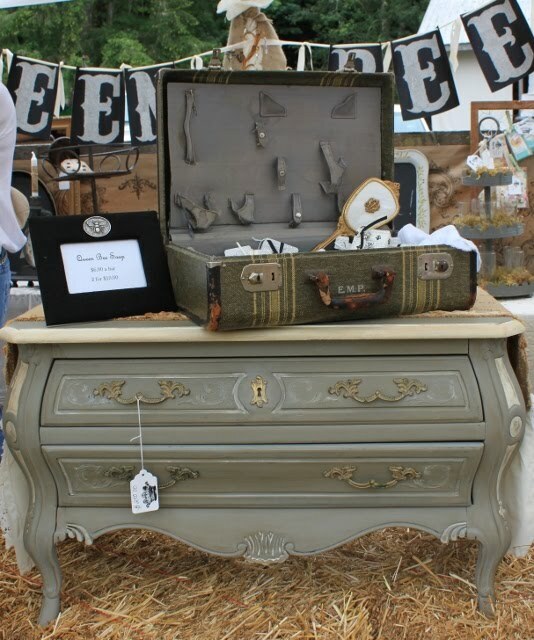 I absolutely love this dresser. It is a beauty and the finish is divine. 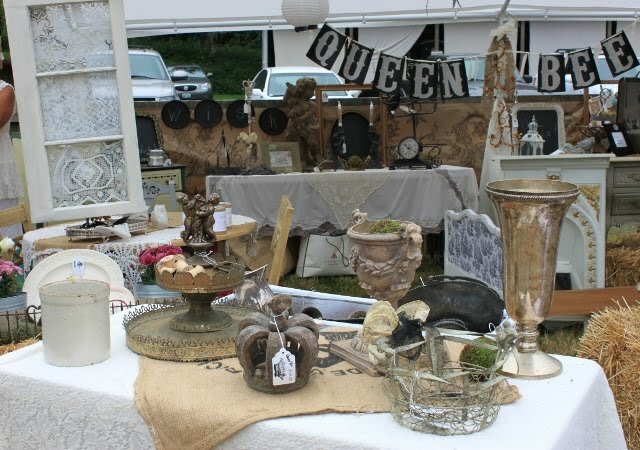 This Flea Market was fabulous and it was such a great success that they will be holding it again next year, the second weekend of September. 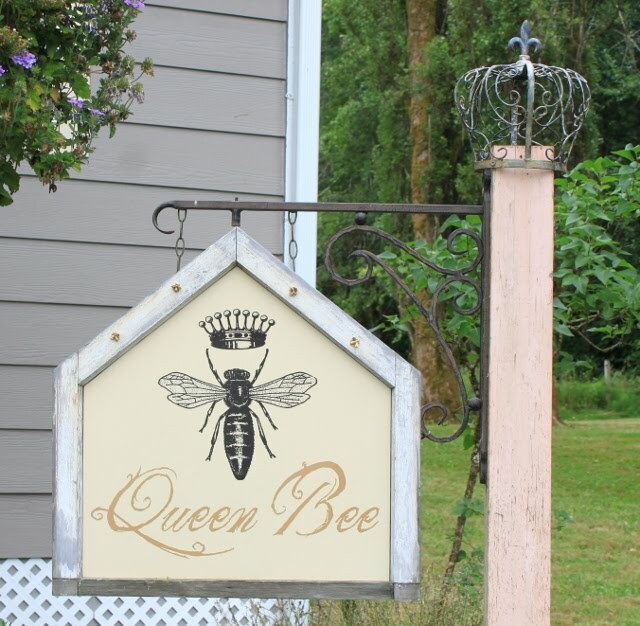 Now, a little about the Queen Bee Art Cottage where the market was held. What a great find, this wonderful little cottage so close to home. 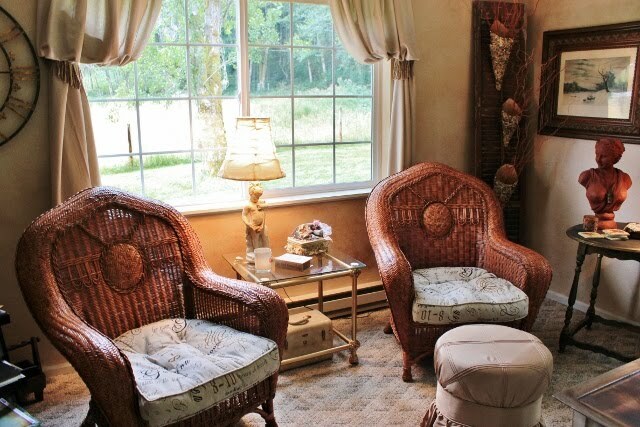 It is available for rental, sleeps 6 in single beds, has a full kitchen and a crafting room. I’m thinking girl’s getaway!!! 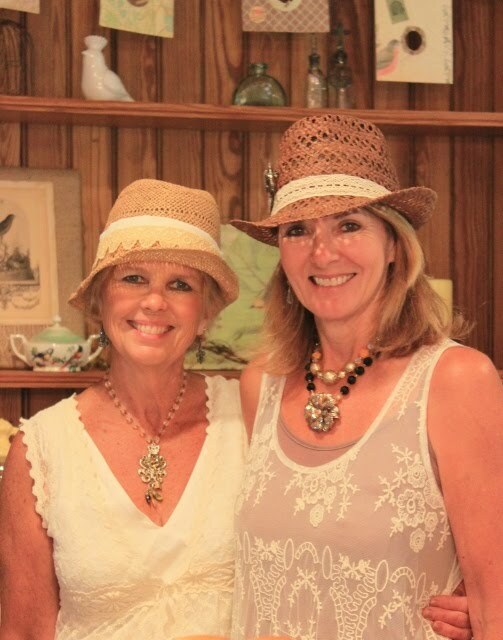 These are the lovely owners, Kim Bridges and JoNell Quinton. 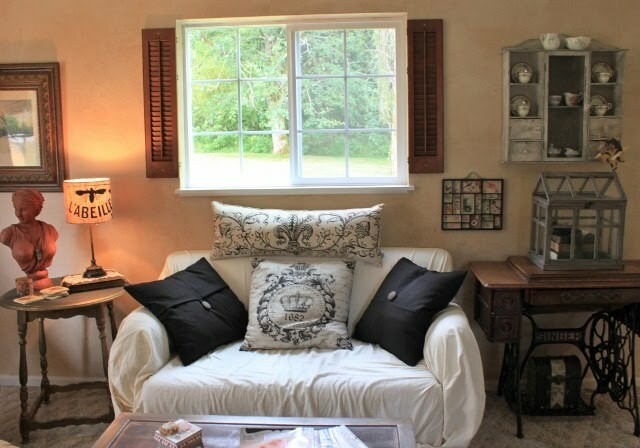 Take a look at a few pictures of the interior. 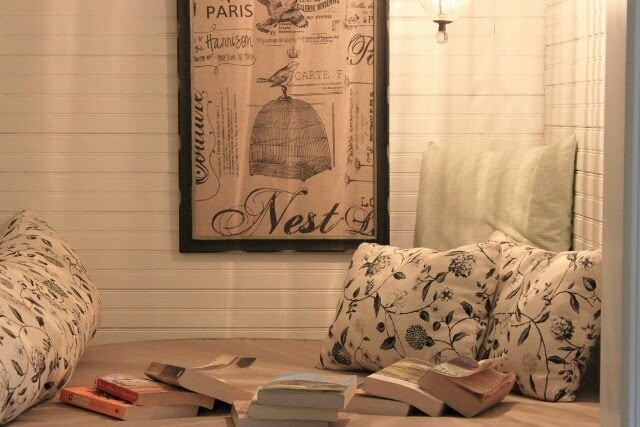 I love this cute little reading nook. 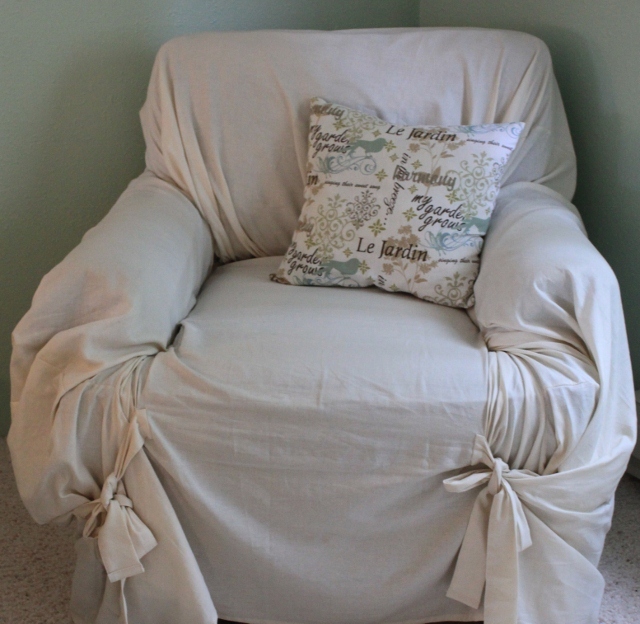 This chair is cozy enough for a snooze, don’t you think? 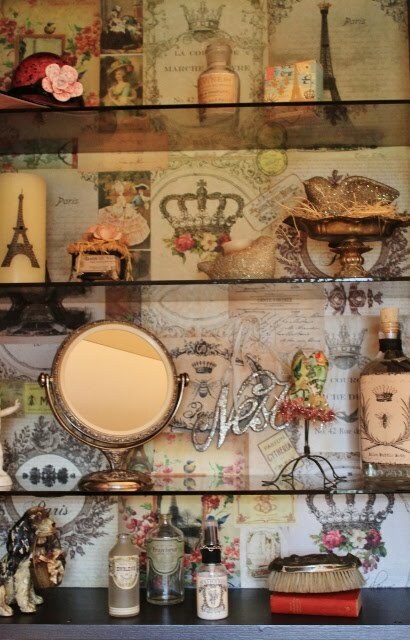 Here a just a few of the fun decorator touches. I will definitely be planning my own little get-away soon. Have a blessed day. 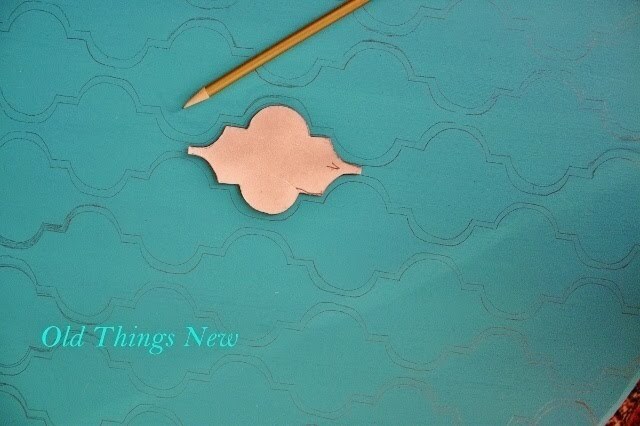 Here is a peek at the top of another project I finished last week. Painting furniture is fun but time-consuming, so it is great when I come across a little treasure that I can whip out in a short amount of time. This is the “before” picture. You may recognize it from my “Behind Closed (Garage) Doors!! !” post. It wasn’t one of the first items to go at the garage sale where I found it. 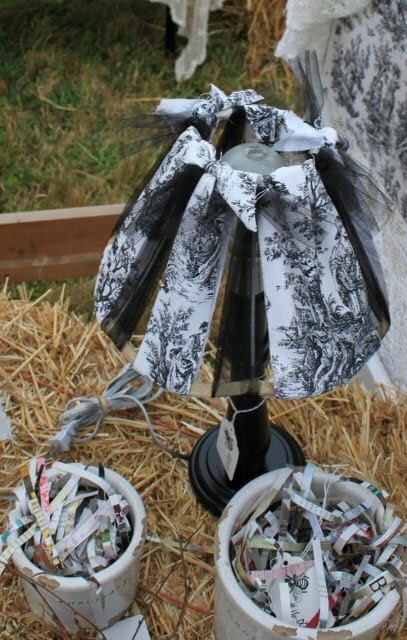 It probably didn’t appeal to many people with it’s little decoupaged birds. 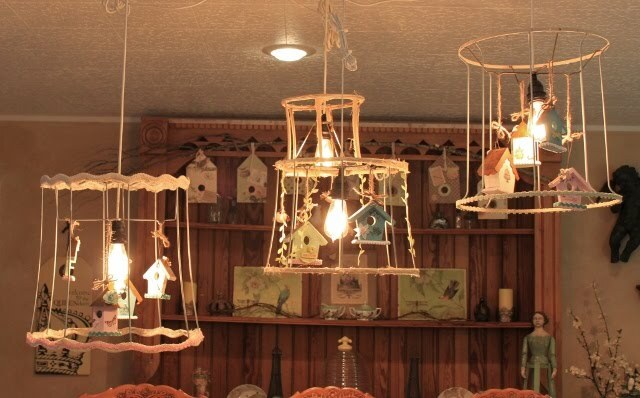 In fact, I initially chuckled and said I should buy it for my husband because he is so into birds right now. Upon closer look I fell in love with the frame and knew just what I would do with it! It was a perfect frame for a chalkboard. So, with a little Annie Sloan Chalk Paint, in Old White, a bit of distressing and an application of dark wax, my frame was complete. Next, I sanded over the birdies in the picture to smooth off their edges, and painted over the entire picture with a few coats of chalkboard paint. 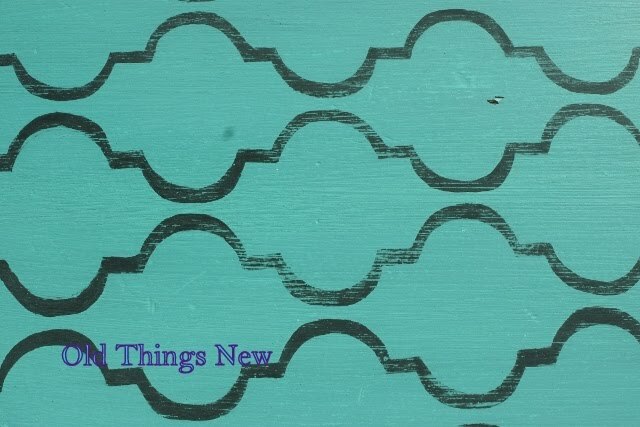 Most everyone knows that you can buy black chalkboard paint at the hardware store and it can be kind of pricey, but did you know you can make your own, and in any color? To create a custom color combine 1 cup latex paint, in the color of your choice, with 2 T. unsanded tile grout. 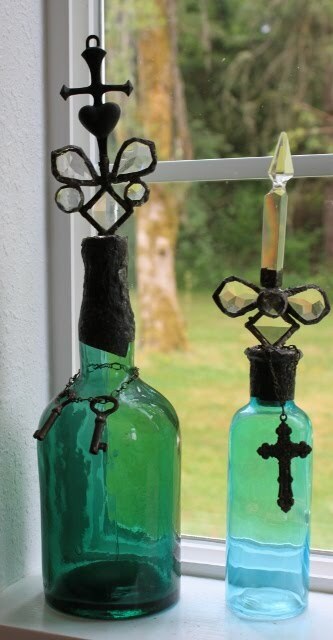 Mix well and apply several coats of paint, allowing it to dry between each coat. Sand lightly between each coat of chalkboard paint. When your project is dry, have fun creating messages on your board. 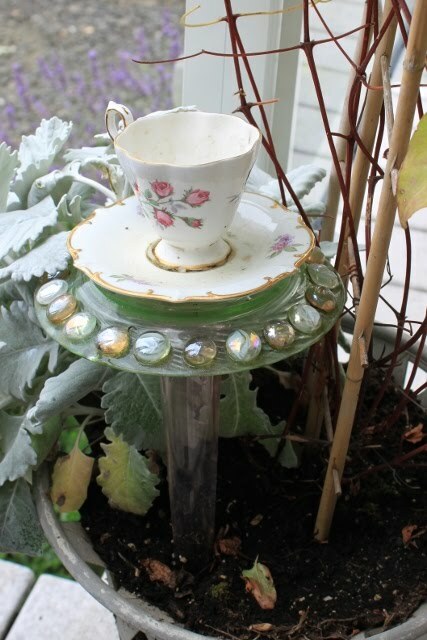 This one is on my dining room window sill. The message is from the Bible, Psalm 34:8. I think it is a fun mealtime message. 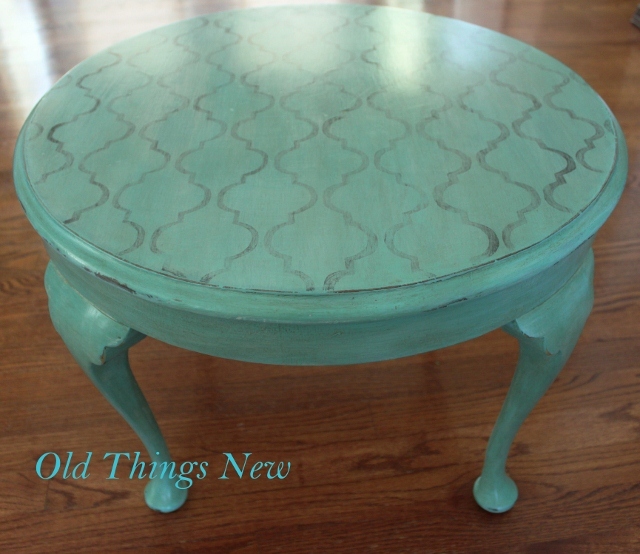 Since the whole reason for starting this blog was so I could talk about painting furniture, I guess it’s about time for me to post another restoration project. 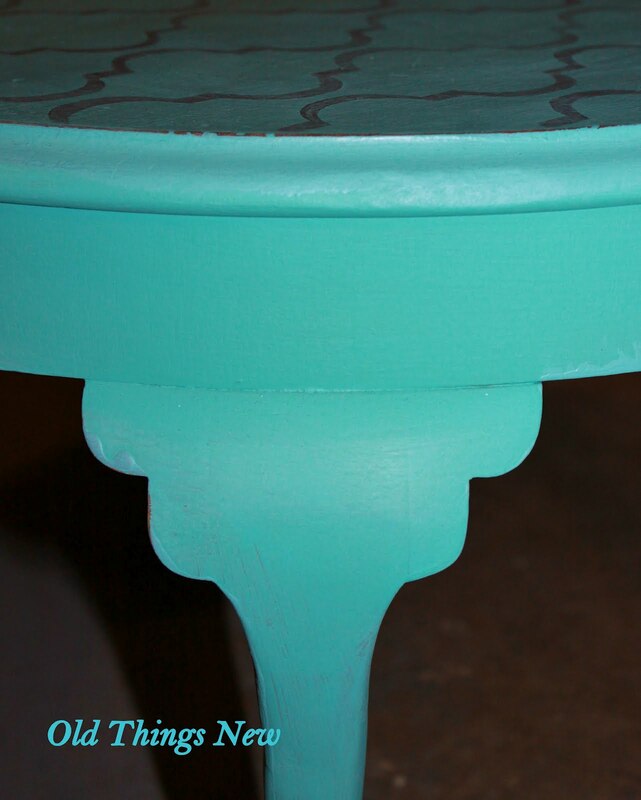 I’m kicking myself because I accidentally deleted the before pictures I took of this table. So, in a picture of words . . . 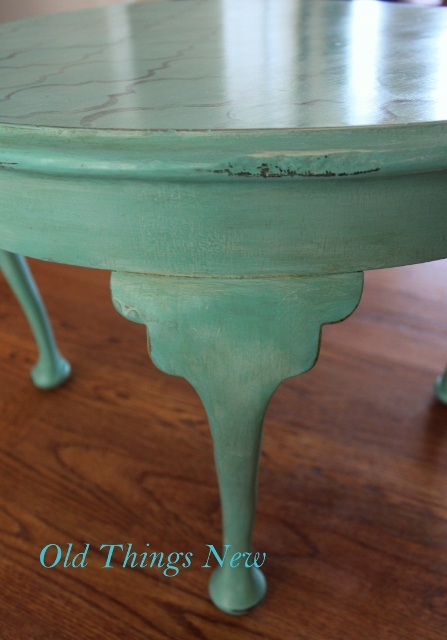 When I first laid eyes on this little Queen Anne table, it was sitting forlorn in a corner of the garage. It’s color was a deep, dark walnut, with a hint of blood-red undertones that seeped eerily to the surface. As I rubbed my hand across the dusty top, the dry feel of the wood sent shivers up my spine and a musty smell arose to fill my nostrils. There was no hint of protective sheen left on the table’s dingy wood, only a dull sadness. Two deep cigarette burns on top were an indication of neglect and abuse. As lost as this table appeared at first glance, there yet remained a hint of it’s former elegance in the shape of it’s lovely legs. 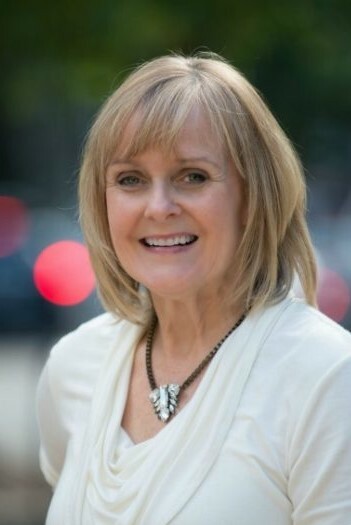 Hope stirred within my heart . . . This is the template that I printed and shrunk to the size I needed on my printer. I cut it out and traced it onto heavy cardboard. Then I started tracing it in pencil on the table top. I traced one side of the shape first, then moved the template over about 1/4″ and traced again, to create the outline I would paint within. Then, I repeated the same procedure with the other side of the template and kept repeating across the entire table. 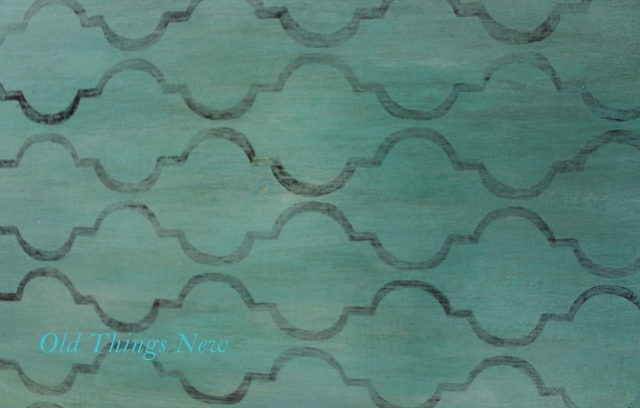 When the tracing was complete I filled in the outline with Annie Sloan’s Graphite chalk paint. My lines aren’t perfect but that just adds a bit of character! After the paint was dry I took out my sanding block and did some distressing. This is how it looks up to that point. 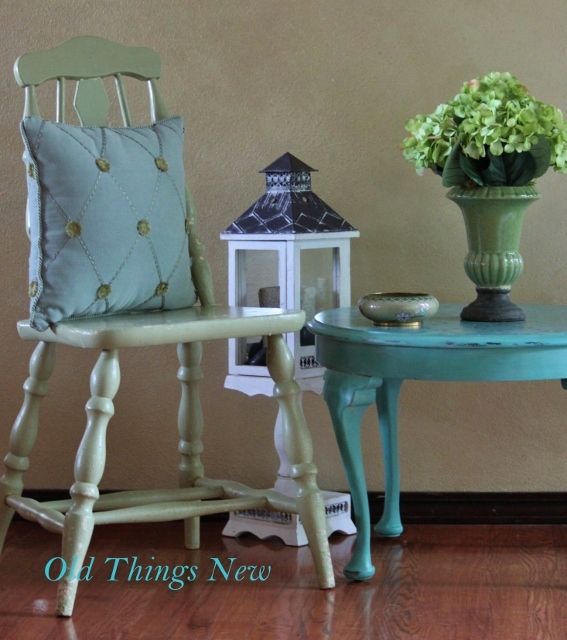 Painting a piece of furniture with chalk paint is a fairly quick and easy process. It is the finishing of each individual piece that consumes the most time. On this particular piece, I felt that the graphite lines were still too “fresh” looking. Since I wanted my table to look like it had aged gracefully over time I thinned some plain white paint with water and brushed it over the entire piece, then wiped most of it off with paper towels. Next, I thinned down some light grey paint I had on hand and repeated the procedure. 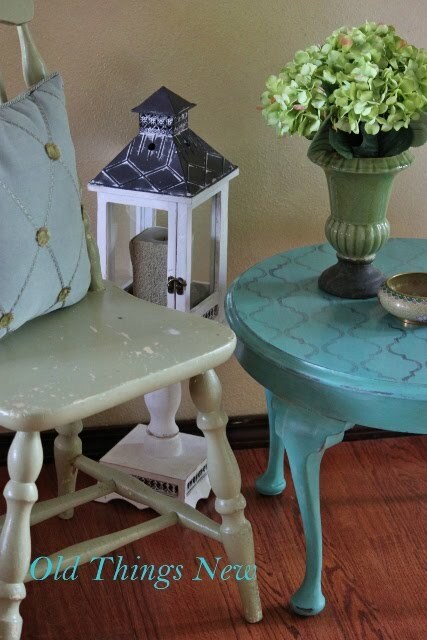 When I was finally happy with the look, and after a short dry time, I did a bit more sanding, and covered the entire table with a mixture of Annie Sloan’s dark and clear waxes to seal. What do you think? I’m happy with the illusion of layers of color coming to the surface. I feel like I’m looking into a pool of water. These photos show how the piece glows after buffing. And here she is, staged to show off her full potential. 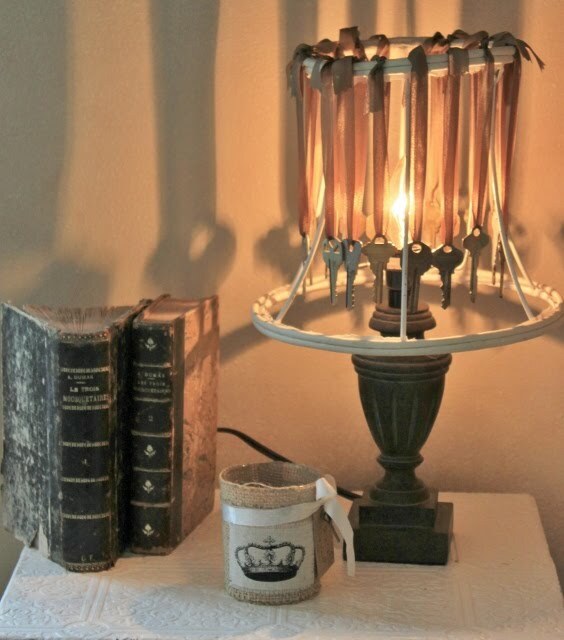 I’d love to hear your thoughts on my sweet little Queen Anne table.